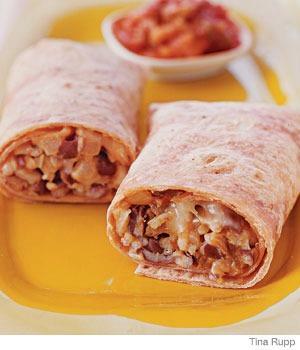 Kids love burritos, and this recipe from parenting.com uses turkey sausage and reduced-sodium taco seasoning for a healthier touch. Preheat oven to 300 degrees. Coat a baking dish with cooking spray. In a heavy skillet, cook the onion in olive oil for 3 minutes, or until soft. Stir in beans, rice, seasoning, salsa and sausage, if using; heat through. Spread 3/4 cup bean-and-rice mixture in middle of each wrap; top with cheese. Fold wraps into burritos, and place seam side down in baking dish. Cover with foil and bake 15 minutes, or until very hot. Remove from oven. Serve with salsa and sour cream, if you’d like.